In a previous post, I discussed my new 3D printer and I briefly mentioned that I'm having z-axis banding issues. I'm not quite sure what's happening, but I initially had severe z-axis banding before printing out some "Z axis fix" parts for my printer. 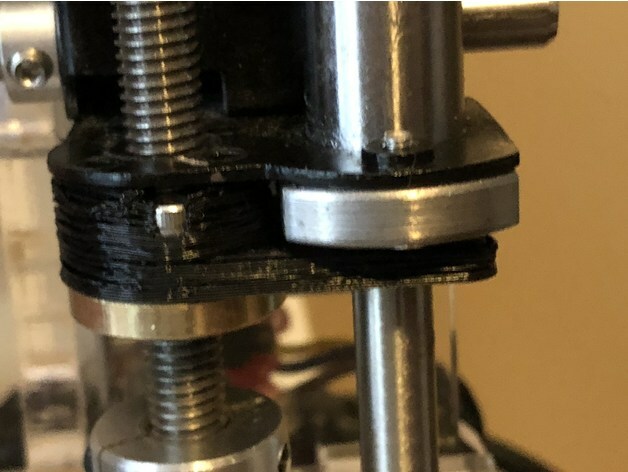 This part disconnects the threaded nut from the X Axis carriage so that it has room to move freely without transferring that movement onto the model being printed. It made a huge difference and I can see detail in my prints that wasn't there before. However, when my printer gets up to about 45-50 mm high, the banding gets so severe that the layer adhesion is almost non-existent. Ultimately, this is a temporary fix because I recently invested in some proper 2 mm pitched lead screws to replace the threaded rods that came with the printer. When I tried to install them yesterday, I learned that the couplings for the threaded rods aren't the right size for the lead screws, so I had to order proper couplings. I decided to go with rigid couplings instead of the flexible ones. Hopefully this will work better. I had binding issues when the motors tried to turn and the lead screw did not fit into the hole all the way, causing it to be at an angle. Once the couplings arrive, I plan to remove the z-axis fix and install the lead screws. Of course, this means that I'll have to level my bed again (my least favorite chore within the 3D printing universe).